PVC Waterproof Case size: length 14in( bag length 10in, three layer waterproof strong seal length 4 inch ) ;Width Approx. 3.5in tapered to 1.8in. High Sensitivity: High Sensitivity for improved detection of small targets, 360° side-scan and Pinpoint tip detection. It can work indoors, outdoors, on sand, lawn or in soil, locate coin, silver, jewelry and gold with speed and accuracy. Three sensitivity levels with different LED indicators light, audio and vibrate alert. One-touch Operation: The pin pointer Quick button press instantly tunes out environment or narrows detection field for precise pinpointing of larger targets. Portable & Lightweight & Multifunctional: pinpointer size is 215.5*41.5*43.52mm. It is design for most adults, and kids. 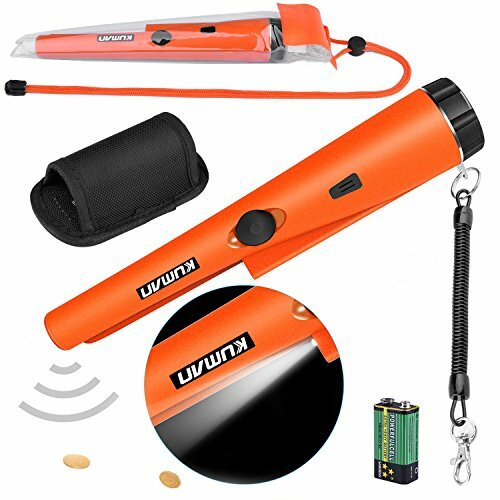 It can easily taken to outdoor such as camping, hiking, treasure hunting, gold detecting.Our pinpointer metal detector is also an excellent gift with nice price.